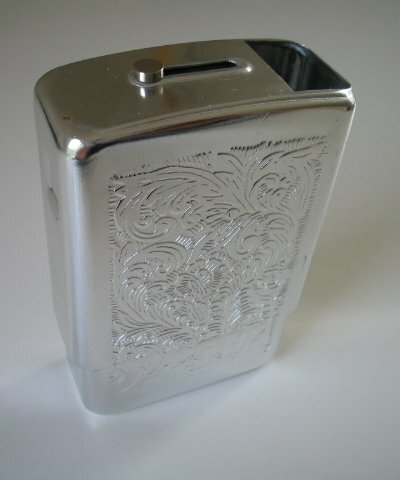 I have a solid Sterling Silver case that I bought off Ebay. It's an antique. Engraved with "Presented by the Officers of the Market Harboro Fire Brigade", with the date Sept 8, 1904. At the end of the day, I guess it doesn't matter what you carry your cigs in, but having a 102 year old piece of history in my pocket is kinda cool, IMO. It's unique, it's solid silver, so it's got some style to it, and it makes a pretty nice conversation piece to boot. And it cost me just under 50 bucks, which is a lot more than the plastic jobs, but only about twice as much as the cheaply built nickel and steel cases you find at smoke shops. To each his own, I guess, but I figure that if I'm going to go to the effort to MYO using fine tobacco, then I think my case should reflect that I'm not smoking "just another cigarette". PS - Just a bit of advice... if anyone is considering one of these antique cases, make sure you check the dimensions and which way the interior straps are aligned. They didn't have filtered cigs back then so most of them only fit unfiltered cigs... although it's possible to find one that's long enough to work. I have been buying this cigarette case from Walgreens for over 25 years. Walgreens has discontinued carrying this product in the last year. I love this case and I have been using it with Virginia Slims. I put the flip top box in without the flip top and it works great. I have been probably bought 5-8 cases throughout the years. Can you tell me where I can find this product. I would greatly appreciate it. Thanks for your help. Sorry to repeat myself BUT I must! JUNK! Bad fit, RIPP OFF- unless you wear a cowboy outfit complete with spurs & turquoise silver mega rings this would be a good place for your store bought pack of red Marbs! WARNING- sharp edges & real sloppy fit." Really-the 'smoky' case is the way to go unless the cowboy outfit is your thing! Amen. I've been using Smokey cases for ages. The oldest one I have is nearly 16 months old and still works fine after normal use. I've never had to toss one because it's been broken--I've only had to replace them due to loss or theft. Although this case is tough and works relatively well for pre-made cigs, it is not very good at all for the SYO/MYO cigs, to which this forum is devoted. Despite the bad reviews it's what I've been looking for. Any idea where I can buy online? You can get them at D&R Tobacco. I've seen these at my local Walgreen's. Also at on-line RYO/MYO stores. Price varies a lot. There's no longer a picture but I think https://www.lilbrown.com/index.cfm?productid=2977 ($2.05) is this case. WARNING- sharp edges & real sloppy fit.